The US EPA's Hydrologic Evaluation of Landfill Performance (HELP) Model is by far the most widely used tool to predict leachate quantity and analyze water balance in landfill lining and capping systems. It is a quasi two-dimensional hydrologic model of water movement across, into, through and out of landfills. HELP generates estimations of runoff amounts, evapotranspiration, drainage, leachate production and leakage from liners. HELP model was developed to help hazardous waste landfill designers and regulators to evaluate the hydrologic performance of proposed landfill designs. Seasonal Soil compartment model (SESOIL) is a transport model that helps in modeling the contaminant transport and concentrations into the unsaturated soil zones. It is a one-dimensional vertical transport model. Typically, it is used to estimate the rate of migration of chemicals through the soils and the concentration of chemicals in the soil layers following chemical release to the environment. Al Akeeder landfill is located in the Yarmouk river watershed. Yarmouk River is shared between Jordan and Syria. The site topography is described as a mix between hilly and semi-flat and located about 650 m above sea level. The aquifer system in the landfill area is considered as a confined aquifer. The depth of the saturated zone is located at 330 to 450 m below the ground surface. The piezometric head of the confined aquifer in the study area is about 400 m above the mean sea level. The site soil can be categorized as silty soil with sand. Leachate is the liquid generated in landfills as a result of dumping the solid waste. It consists of the juice resulting from the moisture contained in the solid waste plus the rainwater that penetrates through the solid waste matrix. Al-Akeeder landfill is unsanitary landfill that does not contain leachate control and management system. Therefore, there is a chance that leachate which has a high contamination potential can reach to both surface and groundwater bodies and rendering them contaminated. The primary goal of the study is to estimate the leachate quantity generated from Al Akeeder landfill, to study the transport of nitrate from leachate to the subsurface soil layers and to assess the risk associated with Al Akeeder landfill leachate to the groundwater at the site. Figure 1 outlines the procedures followed to perform these tasks. 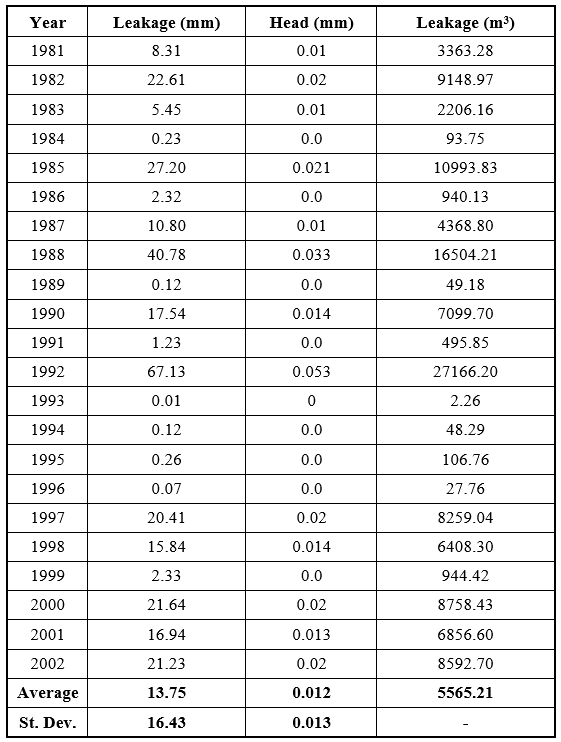 HELP was run using 22 years (1981 – 2002) of daily climatic data for the study area. The landfill was modeled using three layers (from bottom to top), the barrier soil layer, the compacted solid waste layer and the soil cover layer, the soil used for cover is silty soil with sand that is available at the site. Results of the simulation using HELP including annual leakage/percolation, the average head on the top of the barrier soil layer and volume of leakage through the barrier soil layer are presented in Table 1. The fate of the pollutant in the soil column includes both transport and transformation processes, which depend upon the chemical partitioned among the three phases; the soil air, the soil moisture and the soil solids. In SESOIL, to account for the dynamic processes in the model accurately, an explicit time step of one day is used in the equations. The monthly output represents the summation of results from each day. 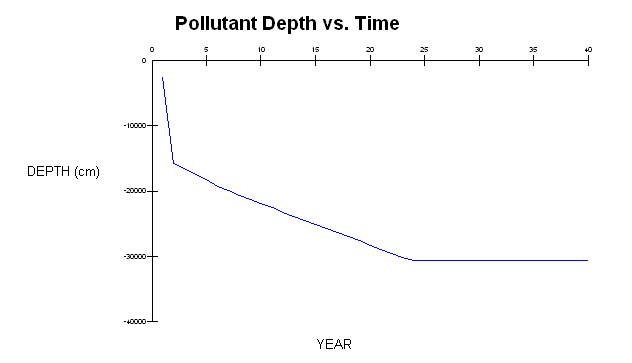 SESOIL was simulated using the available climatic data for the study area. The concept of equivalent hydraulic conductivity was utilized to obtain the effective hydraulic conductivity of each of the three soil layers. The studied contaminant was nitrate, which is a conservative material. Leachate quantity was obtained from the results of HELP model while the quality data were obtained from laboratory results. 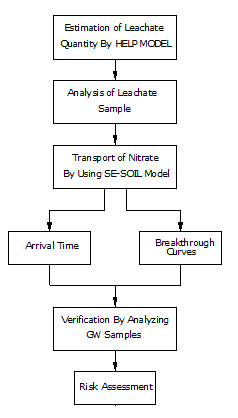 This data was fed to the SESOIL and the results of simulation including the arrival time of nitrate on an annual basis are presented in Figure 2. It can be observed that the arrival time of nitrate from Al Akeeder landfill leachate to the groundwater is about 23 years, which implies that the aquifer is already contaminated by leachate. The presented case study could be applied to other landfills with similar conditions like Al Akeeder landfill. HELP and SESOIL models are useful tools in predicting the groundwater contamination by leachate, provided that precise input data are used. Landfill leachate is a major contributor to the groundwater contamination at Al Akeeder landfill. This has been verified by measuring the nitrate concentration in both upstream and downstream of the landfill. This case study contains excerpts from a Jordan University of Science and Technology MSc thesis entitled: "Environmental and Health Risk Assessment of Al-Akeeder Landfill" written by Luay I. Qrenawi of the Civil Engineering Department, supervised by Dr. Hani Abu Qdais and Dr. Fayez Abdulla. It is republished here with permission from the author.